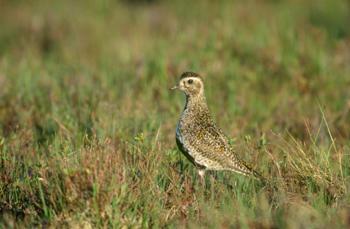 A relatively rare bird in the Forest of Bowland, this moorland specialist is most common on the northern fells. In the winter they move to lowland fields, forming large flocks, often in the company of lapwings. In its spangled black and gold breeding plumage, this shy wading bird is more often heard than seen, a plaintive whistle often the only sign of its presence. In the winter the black is replaced by buff and white. They typically stand upright and run in short bursts.